Occupying a primary location near the mangrove forest, The Oberoi Beach Resort Dubai is an ingenious and luxurious destination in Ajman. There are a lot of facilities in this lavish resort to keep you engaged throughout the day, including kayaking, golf course and much more. 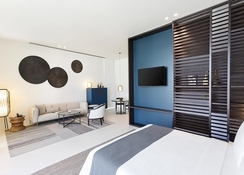 This newly built luxury resort is just 25 minutes’ drive away from the Dubai International Airport and is well connected to many private roads. This marvellous hotel has airy suites and rooms with private terraces on the other hand the villas have temperature-controlled pools. The restaurant in this resort has chic interiors, where the guests can enjoy the best international cuisine, while enjoying the dazzling views of the ocean. 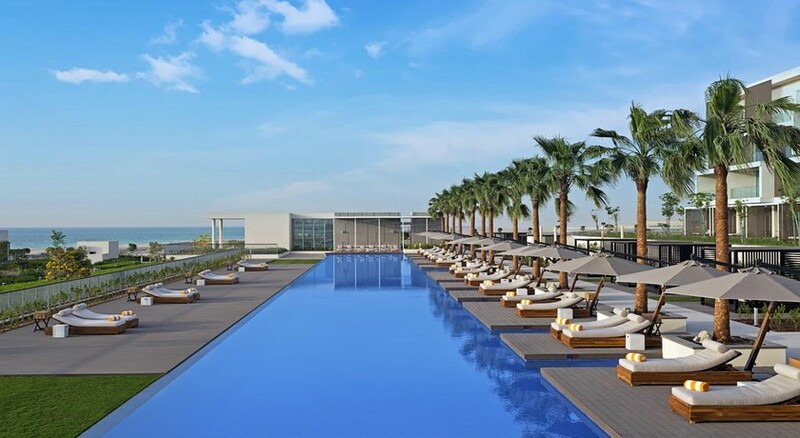 The Oberoi Beach Resort Dubai is conveniently situated in Dubai. This is a good place to stay for golf lovers, as the Zorah Golf Club is only 4km from the hotel. The Ajman Museum, which is one of the famous tourist attractions in the region is about 17km from the resort, on the other hand the Ajman Beach is about 19km from the resort. The Dubai International Airport is 35km from the resort, while the Sharjah International Airport is 28km, making it convenient for the guests to board flights to different cities across the world. 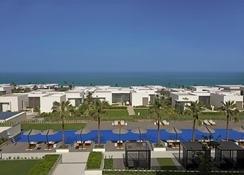 The Oberoi Beach Resort Dubai has spacious and luxurious rooms to accommodate guests. This resort has rooms in many categories to suit the traveller's needs. 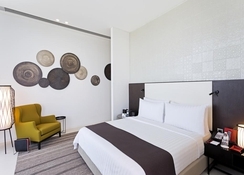 The rooms and suites come with handpicked artwork and authentic furnishings. The rooms in this spectacular hotel are divided into following categories, including Kohinoor Suite, Premium Villa, Premier Suite and Deluxe Suite. 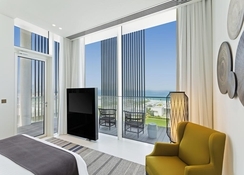 All the rooms feature a large picture window that frame unmatchable views of the sun, sand and the sea. Every room and suite feature a private terrace on the other hand the villas facilitate temperature-controlled pools and a good amount of outdoor space for hosting parties. All accommodations have high speed Wi-Fi access and all the necessary amenities like air-conditioning, Flat screen TV, toiletries, In-room service and much more. The bar and restaurants at The Oberoi Beach Resort Dubai are outstanding examples of contemporary design fashioned for harmonizing with the natural landscape surrounding the hotel. The Vinesse Restaurant in the resort is an all-day dining restaurant that serves international cuisine. 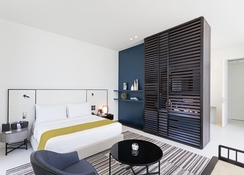 Apart from this, the restaurant also has the following restaurants and bars namely Aquario, Vinesse Bar, Aquario Bar and In-Room service. The poolside lounge that is set beside the pool serves refreshing drinks to the guests. Guests can also experience a lip-smacking lit barbecue dinner, which is prepared by the Oberoi chef, it is catered by the personal butler alongside the pool of their private villa. There are several sport, leisure and entertainment facilities for delighting the guests and keeping them engaged throughout the day. There is a swimming pool, where guests can take a relaxing swim and relax on the sun loungers sparkled across the pool while having refreshing drinks. Those who want to stay in shape can head to the fitness centre that is exclusively available for the hotel’s guests. If you want to laze, then head to the spa that offers a number of massages and beauty treatments. Cards accepted: American Express, Visa and MasterCard.